Chef/co-owner Sarah Stegner of Northbrook's Prairie Grass Cafe is sharing her grandmother's recipe for heart-shaped Valentine's Day Cookies. Stegner is known for her support of Chicago's Green City Market, local, sustainable farms and using seasonal, fresh ingredients in her restaurant. Her grandma's cookies feature an all-natural icing with no food dye. A beet turns the icing pink! The recipe calls for a “farmer’s egg” and “local" cream. I’m going to use what I have on hand. Mix together the flour, baking powder, salt and sugar. Cut the butter into the flour mixture. Add the egg, cream and vanilla. Blend thoroughly. Chill the dough. 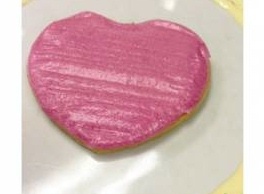 Then roll the dough out on a floured surface to desired thickness and cut with heart-shaped cutter. In a mixer, blend the butter and sugar. Add the cream and continue to beat until smooth. Add the vanilla and mix well. Using a coarse microplane grater, grate approximately 2 tablespoons of red beet into frosting. Stir by hand with a rubber spatula till frosting is bright pink. Thanks to Kurman Communications for sharing this recipe.